The LT-1 Level Transmitter is designed to be used with the LG Series Magnetic Level Indicators to provide a 4/20mA signal proportional to level. The LT-1 is a low-cost alternative where precise measurement and communication is not required. The unit mounts externally on the chamber and consists of a sensor tube made up of a string of resistors and magnetically operated reed switches. 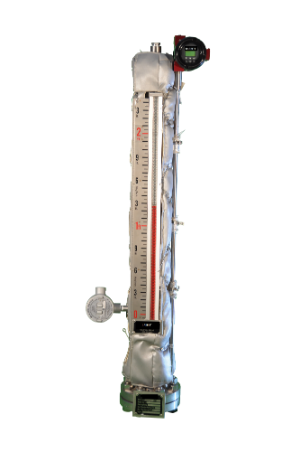 The LT-1 is an analog transmitter with no digital display and provides step up level in ½ inch increments (¼ inch resolution is available for units under 30” in measuring length.) This transmitter is the preferred choice for applications with significant vibration. Babbitt LTM 250/350 series magnetostrictive level transmitters offer highly accurate and precise liquid level measurement. The LTM mounts externally to the magnetic level indicator for non-invasive level measurement. This allows the unit to be installed and serviced without having to remove the indicator from service. The LTM senses the fluid level by detecting the magnets inside the float and transmits the measurement back to the control system. For high temperature applications, the transmitter should be remote mounted.